In its first ever complete STARS submission, UC Berkeley earned a high Gold rating in the Sustainability, Tracking, Assessment & Rating System, which is used by more than 900 colleges and universities around the world to establish their environmental and social sustainability bona fides. UC Berkeley has long led the way in sustainability research, be it environmental, social or economic sustainability, and that history fills the campus' course catalog. Sustainability classes don't come only from perhaps more predictable departments such as Environmental Science, Policy, and Management or Sociology. Students can also learn how U.S. populations have interacted differently with their environment throughout the nation's history (History 120AC) or how environmentalism and politics intertwined in Cold War Germany (German 160C). Did you know that during this year’s winter curtailment we anticipate saving energy and over $100,000? Help us do more! The Climate Leadership Network, made up of the over 500 signatories to the Presidents’ Climate Leadership Commitments, mobilizes the sector’s knowledge and practical expertise to accelerate global climate action and local community impact. UC Berkeley will be looking a little lighter and brighter in the next few weeks after nearly 100 new energy-efficient LED lampposts are installed across campus. IPCC Report Findings-- What can you do? “Every degree matters, and the warmer it gets, the worse it gets.” Umair Irfan, a staff writer from Vox who covers climate change, says that might seem like an obvious statement. However, that simple sentence carries enormous weight for the future of millions of people and ecosystems. The Intergovernmental Panel on Climate Change (IPCC) released a report on Monday that detailed the drastic impact that climate change will have on humans and the environment if global temperatures continue to rise. From UC Office of the President, "UC sets higher standards, greater goals for sustainability"
At UC Berkeley on September 11, 2018, UC faculty, staff and student leaders will address how they are working to achieve carbon neutrality for the whole UC system by 2025 and leaders from major corporations will also discuss the steps necessary to turn their organizations' ambitious climate goals into reality. UC Berkeley Chancellor Carol Christ will offer opening remarks. Chou Hall on track to be first ‘zero waste’ business school building in the U.S. Many Community Choice Aggregators are marketing clean energy by simply rearranging where existing low-carbon electricity goes. With its new bike paths, urban cycling classes and student-run bicycle co-op, UC Berkeley is one of the most bicycle-friendly campuses in the country, as ranked by the League of American Bicyclists. An infographic we featured at the Sustainability Summit. Berkeley wins Pac-12 Zero Waste Game for the 4th year in a row! The Office of Sustainability is very pleased to announce our new Instagram platform! Instagram is a photo-sharing social media that is popular among college students, and we believe it can be a fun and creative way for everyone (not just students) in our community to express their sustainability aspiration and passion. Social media can be a powerful tool for creating a connection throughout the wider campus community, and that’s why we’ve decided to take on a new one. How are the nation’s renewable energy innovators building a more sustainable future even in the Trump era? Industry leaders, researchers and top government officials will answer that urgent question at the Berkeley Energy & Resources Collaborative (BERC)’s annual Energy Summit - the biggest student-run energy conference in the western U.S.
Water is a precious resource, and every drop counts. On February 24th, Cal will be defending the champion title for the 4th year in the Pac-12 Road to Zero Waste Competition, at the Men's basketball game against University of Washington. This year’s theme is centered around zero waste and sustainability, emphasizing ReUSE. Elementary students from Hesperian Elementary in San Leandro will be volunteering to “trash-talk” with fans at the game. Volunteers will be there to help fans reduce, ReUSE, recycle and compost. Did you know that during this year’s winter curtailment we anticipate energy savings to save over $100,000? Help us do more! Did you know that during this year’s winter curtailment the Campus Energy Office anticipates energy reductions to save over $100,000? Help us do more! UC Berkeley participated in the 2017 Pac-12 Zero Waste Bowl & GameDay Challenge, where universities from the Pac-12 Conference competed to divert the most waste from landfill at a selected football game. The competition is scored based not only on diversion rate but also on fan engagement, innovative promotional tactics and partnerships with businesses and different campus departments. As a part of the UC Berkeley Green Labs (GLs) program, recent efforts this semester focused on recirculating water within the College of Chemistry from traditional chemical condensation reactions. It is estimated that a typical column reaction consumes 3,600 liters of water for every 24 hours. After discovering that some groups were running continuous reactions for days or even weeks at a time, GLs grew determined to collaborate with these labs to help them achieve their water-saving potential. The Student Carbon Neutrality Fellows will engage and communicate about campus and UC-wide sustainability goals and programs with a focus on climate related issues. The fellows will coordinate in-depth campaigns, including green certification programs at Berkeley and work with other fellows across the UC System. The Office of Sustainability was a proud contributor to this year's Golden Bear Prep, a required on-line orientation for new students. Over 7,000 new undergraduates completed this learning module highlighting campus sustainability and ways to get involved. This is the first time we've been able showcase our points of pride to so many incoming students! Berkeley proudly ranks 27 out of 227 participating universities in the Sierra Club's Cool Schools 2017. Based on this year's criteria we did especially well for our sustainable transportation (ranking 9th) and water (ranking 14th). As a large public research institution this is an accomplishment. But there is more we can do, together, to be a leading sustainable campus. Bringing solar power to the Berkeley campus has been a top priority for sustainability. This year we met our goal of fully realizing four new campus solar sites and ushering in an era where campus renewable electricity systems have become a more welcome part of Berkeley's energy program! When Doug Bell heard that a pair of peregrine falcons was nesting on the Campanile, he couldn’t believe his luck. An avid falconer, Bell has been fascinated with peregrines — the fastest animal in the world — since he was a kid growing up in Berkeley. He received his Ph.D. in zoology from UC Berkeley, where he studied ornithology and systematic biology. But never before had he heard of peregrines nesting on top of the campus’s 300-foot-high bell tower. “It blew me away,” he says. With some of the world’s greatest assets of plant, animal, ecosystem and human diversity, and as the world’s sixth largest economy and provider of more than half the nation’s fruits, nuts and vegetables, sustaining California’s vitality is paramount. And as we face greater demands from a changing climate and growing population, taking a proactive approach to maintaining sustainable growth for California is critical. Why are humans so bad at thinking about climate change? As Africa gears up for a tripling of electricity demand by 2030, a new Berkeley study maps out a viable strategy for developing wind and solar power while simultaneously reducing the continent’s reliance on fossil fuels and lowering power plant construction costs. Read more. Sign-up for Viewing "Before the Flood"
In celebration of Earth Week and Climate Change Action, UC Berkeley Office of Sustainability and Energy and Students Environmental Resources Center are sponsoring FREE tickets to join East Bay Climate Action Expo: a night to celebrate the community-based efforts to address climate change issues in the Easy Bay. In January, Berkeley won one of PepsiCo's inaugural Zero Impact Fund grants: $10,000 for our Cal Zero Waste efforts. The Blue & Gold Make Green: Golden Bears Strive for Zero Waste project was one of only 8 winners nationwide. By adding zero waste bins, signage, education and outreach to the campus community, the project will contribute to efforts to achieve the campus zero waste goal by 2020. For more information visit the Zero Impact Fund site. Stay tuned for more campus updates. Send a resume and cover letter describing your interest in and qualifications for the position to Lisa McNeilly (lmcneilly@berkeley.edu). Positions will be open until filled, but the first review of resumes will happen on March 13, 2017. UC Berkeley is a leader in 3D printing. The technology got its start on campus about a decade ago and continues to grow. With this surge in popularity has come a surge in plastic waste. Now, with more than 100 printers on campus, at least 600 pounds of trash is generated each year. But Nicole Panditi, a mechanical engineering student, and Scott Silva, and environmental sciences student, have a solution. Check out the video from the Cal Dining Sustainability Team: Weigh Your Waste! The Office of Sustainability and Energy participated in last month’s Big Give and wanted to share our appreciation for all who donated. Your generosity and support over the years of our efforts is greatly appreciated. Your backing will continue to be important as the campus tackles global and local challenges like achieving carbon neutrality and responding to the historic drought. Increasing people's access to electricity can help uplift them out of poverty especially in places that lack any access. For the past two decades, renewable energy technologies have made an enormous progress to prove that the solution to improving poverty is renewable energy. Read more about Dr.
UC Berkeley is once again honored by the Princeton Review as one of the most sustainable universities in the country. We were recognized for our climate action planning as well as our work on energy efficiency and the number of engaged sustainability student groups. Our work in water conservation, sustainable food, and active transportation were also part of the favorable review. Have you ever considered the combination of energy-efficiency, net-zero emissions, and renewable energy to build a truly energy-efficient, environmentally-friendly, and innovative home? UC Berkeley’s own Solar Decathlon Team is on a quest to blend engineering and design ingenuity with environmentally-friendly concepts and to build their first zero-emission home from the ground up! Energy efficiency may be the answer to reducing our electricity consumption and combating climate change, especially when it can be achieved without sacrificing consumers’ comfort and convenience. California’s Energy Commission approved $1.9-million in funding to a research team, led by UC Berkeley’s Center for the Built Environment to integrate commercially-available smart ceiling fans and thermostats in under-served and low-income families in California. This project will evaluate how to achieve energy efficiency without sacrificing comfort. Join the 1st Bic2Cal Challenge starting October 5th! On this year's International Walk and Bike to School Day EECS is challenging the UC Berkeley community, students, staff, and faculty, to team up for sustainable transportation and fight climate change with us. You will be able to choose, from a number of different mini challenges, the ones that are right for you, so everyone can participate. Did you know that twenty percent of faculty and staff at UC Berkeley are certified under the Green Department Certification program? Are you one of them? If not, you can help achieve the campus’ goals of carbon neutrality, zero waste, and water conservation by getting your department involved. If you’re interested in learning more about this program, please contact the Director of Sustainability & Energy, Lisa McNeilly (lmcneilly@berkeley.edu). The Office of Sustainability and Energy now has six new and returning student associates -- all talented, smart, and commited to helping the campus reach its sustainability goals. We are sharing their answers to a few questions below by way of introduction. Join me in wishing them a fun and productive year! Looking for sustainability classes, groups & co-curricular opportunities? There are many ways to learn and get involved in sustainability at Berkeley. The following are some resources and opportunities to check out. The College of Chemistry serves as a shining example for UC campuses in its waste minimization efforts through the establishment of its distinctive Chemical ReUse Faciilty (CRF). This chemical storage facility serves as a community pool of reagents that all research groups affiliated with the College can access at no cost. Apply to be part of the TGIF Committee! Open Seats: Student-at-Large Representative; Apply Here! Environmental Sustainability Community-at-Large Representative; Apply Here! Applications are due Monday, September 19th, 2016 5PM. Cal Dining has just opened the first dining station in the UC system that is certified kosher and designed to appeal not only to the Jewish community on campus, but also to Muslims who eat halal foods, as well as students who are vegetarian and vegan. The new food station is part of an overall revamping of Café 3 to emphasize plant-forward meals that are sourced locally and sustainably. This is in line with Cal Dining’s overall goal of producing menus that are both nutritious and sustainable. Article Courtesy of the City of Berkeley Mayor's Office. UC Berkeley students embarked on Oceanus to begin their 10-day voyage on the sea along the coast of California to explore how much carbon is stored by the ocean and to understand how this interaction relates to global climate change. James Bishop, a UC Berkeley professor who led this research, actively engages with students who are interested in biochemical processes of aquatic ecosystems via undergraduate research sponsored by the Undergraduate Research Apprenticeship Program (URAP) and teaching a Big Idea Course, called "Oceans". Health and safety of Olympians has been an ongoing story at Summer Olympic games. In 2008, air quality raised concerns in Beijing, while 2016 has been dogged with questions about polluted water and the Zika virus. Now, a new commentary co-written by UC Berkeley professor Kirk Smith says the future of the summer Olympics may be in jeopardy for another reason: rising heat and humidity due to climate change. The UC Global Food Initiative just announced the winners of the "30 under 30" leaders in Food systems! We are so pleased and excited that 6 of the 30 chosen winners from around the country are alums or students of UC Berkeley! Congratulations to Ruben Canedo, Lauren Ponisio, Laura Moreno, Sophie Egan, Jamal Ahmad, and Elaine Lander!! In May 2016, 11 departments gathered to celebrate their recent certification as Green Departments. The departments vary in size, mission, and location, but share a common goal of making the campus more green. Their Green Teams worked over the last three months to make improvements and to educate their colleagues on new and existing practices. Their efforts were recognized at a recent gathering, where CNR Dean Keith Gilless presented the teams with their certificates. Congratulations to all eleven departments! Graduating seniors Lindsey Agnew and Ben Rushakoff reflect on their experiences working with the OS&E for three years, and share their plans for the future. On Wednesday April 27, 2016, the Student Environmental Resource Center’s (SERC) dream of a physical center on the UC Berkeley campus became its future. The ASUC Senate approved an allocation of 1350 sq. ft for SERC space in the MLK Jr. Student Union Basement through the year 2050. Space for SERC has been the focus since its founding in 2012 by students Mauricio Castillo, Nolan Pack, and Noah Puni, who transferred to UC Berkeley and developed a vision for an innovation and resource center for the student environmental and sustainability community. Now, that vision is a reality, and the Center will be a place for our community to combine imagination and intellect, values and passion, all towards growing a world that is more sustainable, just, equitable, healthy and resilient for all. Are you passionate about food security, access, and education? Funding is available to help support your work! The UC Global Food Initiative is offering 4 fellowships of $4,000 each to outstanding UC Berkeley undergraduate and graduate students. The four fellowships are Equity and Inclusion, Experiential Learning, Food Access and Security, and Student Ambassador. Four years into a record-breaking drought, work crews have spent the past months replacing selected grass lawns on the UC Berkeley campus with mulched beds and regionally appropriate, drought-tolerant plantings. In conjunction with UC Berkeley’s commitment to sustainability and green design, and support from The Green Initiative Fund, Building Sustainability @ Cal (BS@C) is proud to be working with the Division of Real Estate to create a program that promotes sustainable building on campus. BS@C’s program trains student interns with the goal of reducing the environmental footprint of buildings on the UC Berkeley campus. Record-setting warmer temperatures are becoming the norm across the planet, and sea-level rise poses a real threat to humanity. What are your solutions? Interested in applying concepts of sustainability into one of your courses? Want to learn about teaching sustainability and campus resources to help? Want $1000 to help with incorporating sustainability into your teaching? Apply to participate in the Faculty Curriculum Sustainability Workshop! To formally recognize contributions of those helping the campus to meet its sustainability goals, the Chancellor’s Advisory Committee on Sustainability (CACS) annually provides awards to faculty, staff, and students that have done outstanding work. The campus community is indebted to the hard work of students, staff, and faculty making Berkeley a more sustainable place to work, live, and play. Nominations can be made for groups or individuals and are open to the entire Cal community. Last fall students, staff, and faculty across the UC system took action in the Cool Campus Challenge (CCC) to reduce their carbon footprint in response to the pressing global issues of climate disruption and to help UC meet its commitment to be carbon neutral by 2025. At Berkeley 1,750 faculty, staff and students joined the challenge! Our collective actions will reduce 1,021,720 million of pounds of carbon emissions each year. Berkeley had particularly high involvement of teams based on campus departments and organizations, and nominations of climate heroes. In its third year, the energy management initiative continues to reduce energy use and costs. This success is driven by actions small and large, from all across campus. Through the energy incentive program – which tracks and rewards savings by campus operating units – the team has seen all units adopt energy-efficient practices. The California Higher Education Sustainability Conference (CHESC) and host campus, California State University, Fullerton, invite you to submit a proposal to speak, nominate a campus for an award, or present a poster at this year's conference! CHESC highlights cutting-edge research, as well as case studies with proven successes in curriculum development, operational programs, and community partnerships. This unique event is jointly organized by independent/private colleges, California Community Colleges, California State Universities, and the University of California, creating the opportunity for dialogue across institutions. Do you know a staff member who has had a significant positive impact on sustainability or other areas of the UC Berkeley campus community? Recognize their efforts and nominate them for the 2016 Chancellor's Outstanding Staff Awards. The Chancellor's Outstanding Staff Award (COSA) is one of the highest honors for staff at UC Berkeley. TGIF Spring Grants Available - Earn Over $2,000 for Your Project! Applications are now being accepted for The Green Initiative Fund's Spring Grant Program. The spring grant program gives preference to larger and more complex projects. Applicants must first submit an abstract form by one of two possible deadlines, January 29, 2016 by 5pm OR February 26, 2016 by 5pm, before they are invited by the TGIF Committee to submit a Final Application by 5pm on April 1, 2016. Not all abstract submissions will be invited to Stage 2. Find Out which UC Won the Cool Campus Challenge! Who gets to claim the title of the University of California’s coolest campus? After 10 weeks of competition in the first ever Cool Campus Challenge, UC Irvine emerged victorious after a tight race to the finish. Claire Kaufman, a UC Berkeley senior studying Environmental Economics and Policy, inspires staff, students, and faculty to become aware of their power. When it comes to carbon neutrality, “I was very inspired by the groundbreaking leadership role the University of California has taken” Kaufman explains. Cool Campus Challenge Carbon Heroes Anne and Barb want you to Sign Up and Pledge to Keep the Lights Out! Berkeley staff members Anne Stinson and Barbara Evans - coworkers, office mates in the A&E Building for 20+ years, and Cool UCB Real Estate Team Members - share how they lower their carbon footprint on campus, at home, and in the commute in between. Both Anne and Barbara are translating their passion for carbon neutrality into leadership in the Cool Campus Challenge. Ben Taube, a 4th year Sustainable Environmental Design major, inspired Cal Band to join the Cool Campus Challenge “as part of an existing initiative of Cal Band going green”. On Saturday, November 14th UC Berkeley will not only be competing on the football field against Oregon State, but also against other universities across the nation in the Gameday Recycling Challenge and the Pac-12 Zero Waste Bowl! These two challenges are a friendly and spirited way for colleges and universities to promote waste reduction at their football games. Each campus participating selects one of their home games to use as their competition game. Green Department certification recognizes campus departments and events that have taken extra steps to be more sustainable. The program identifies a set of conditions and actions - some optional and some required - that can be followed in order to be certified. Some of these actions include purchasing and transportation and qualify as points for categories such as waste reduction and energy savings. Fun events are planned from November 16-20 to celebrate Zero Waste Week. Events include discussions on composting and meeting the Campus Refuse and Recycling Team, with giveaways of readers and reusable bags. This executive summary of the full report, Bending the Curve: 10 scalable solutions for carbon neutrality and climate stability, presents pragmatic paths for achieving carbon neutrality and climate stability in California, the United States and the world. More than 50 researchers and scholars — from a wide range of disciplines across the University of California system — formed a climate solutions group and came together in recent months to identify these solutions, many of which emerge from UC research as well as the research of colleagues around the world. 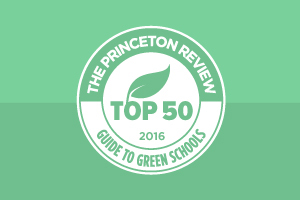 The Princeton Review reports green ratings for 804 Colleges for 2016- and UC Berkeley makes the top 24! California Gov. Jerry Brown, University of California President Janet Napolitano, politicians, industry leaders and UC’s top climate experts are descending on San Diego at the end of October with a shared sense of urgency. The goal: to emerge with a practical and scalable blueprint for tackling climate change that can be applied to California and the world. Will Berkeley be the Coolest UC of all? Climate disruption and fun — two words you have probably never heard together - until the Cool Campus Challenge launched earlier this month. Congratulations to September's Bright Green News Raffle Winner! Congratulations to Mika Sebastian for winning a $50 gift certificate to the Berkeley Student Food Collective! Mika is a first-year Integrative Biology major who enjoys walking through the redwood groves on campus. While she has yet to visit the BSFC, she is excited to try out their locally-sourced and sustainably-produced foods. Here's a mid-semester update on the various bike-related projects happening around the campus. Installations are underway at five campus sites. The Department of Environmental Science, Policy, and Management (ESPM), located within the College of Natural Resources, has recently achieved Green Certification through the Office of Sustainability and Energy's Green Department Certification Program. This program highlights the efforts of campus departments that have taken extensive and innovative steps towards becoming more sustainable through providing documentation on specific criteria that they meet. Welcome back, Campus Bike Riders! Hopefully, you had a fantastic summer and took advantage of the less-than-overcast weather to do some extra riding. To kick off the 2015-16 academic year, here’s an update on several exciting bike-related things that have been happening around the campus. On July 20th, the Carbon Neutrality Initiative Fellows attended the California Higher Education Sustainability Conference to present their projects and research. These students are the first cohort awarded this fellowship, which was created to promote research dedicated to reducing the carbon footprint of the UC campuses and their surrounding communities. Two years ago, UC President Janet Napolitano created an intitative that required all UC campuses to be carbon neutral from building energy use and fleet by 2025. Berkeley excels in many higher education rankings and can now add another high score: Sierra magaz ine, the official publication of the Sierra Club, ranked UC Berkeley in the Top 10 of its recently released ninth annual “Cool Schools” ranking of America’s greenest colleges and universities. UC Berkeley won the first ever Pac-12 Zero Waste Challenge put on by the Green Sports Alliance, an organization consisting of over 300 teams, leagues, and venues. The GSA is committed to promoting sustainability through the platform of sports. Lin King, Recycling and Refuse Manager and Katherine Walsh, Director of the Student Environmental Resource Center accepted the award at the Green Sports Summit in Chicago. In 2013, UC President Janet Napolitano announced plans for the entire University of California system to achieve carbon neutrality of buildings and vehicle fleets by 2025. In order to help achieve this zero net energy goal, the Office of the President has created a fellowship program to help make an action plan and provide channels for communication among the 10 UC campuses and associated facilities. Several UC Berkeley students have been working on various aspects of the carbon neutrality initiative. UC Berkeley was honored for its sustainability achievements in the annual Energy Efficiency and Sustainability Best Practice Awards. UC Berkeley won in the Student Energy Efficiency Program for LED Microscope Retrofits and in Overall Sustainable Design for the new Campbell Hall. Lower Sproul Will Soon be Back and Greener than Ever! The new Lower Sproul Plaza is on track to become one of the most sustainable areas of the UC Berkeley campus. From green building design to innovative stormwater management practices, the Lower Sproul redevelopment project is striving to minimize its environmental impact across a variety of spectra.The project is scheduled to be complete in Fall 2015. BearBuy users now have the option to purchase 100% recycled content paper from Georgia Pacific. BearBuy, the campus’ online procurement system, previously offered Aspen 30 copy paper made from 30% recycled content. At $32.47 per case, the new 100% recycled copy paper is both cheaper and more environmentally-friendly, leaving no reason not to transition to it for your copy paper needs. Not enough reason to shop at the Berkeley Student Food Collective? Well check out their discount calendar system! Multicultural student discount day (5%). Are you an active member in a multicultural student group on campus? Come to the Food Collective every Monday and enjoy 5% off your purchase! To tackle problems related to quantifying and reducing campus emissions, a student-faculty-staff group called the Cal Climate Action Partnership (CalCAP) was formed in 2006. Community Choice Energy is a program that allows cities or counties to form a not-for-profit local power agency that bundles the buying power of residents and businesses to purchase electricity. Community Choice empowers local governments to decide where their electricity comes from. The local power agency can purchase electricity from the market or develop clean energy resources to generate its own electricity. Choosing where our electricity comes from lets the community decide how quickly to transition to clean energy. Water levels in California are currently at the lowest point since records began 100 years ago, and are not expected to recover soon. In response to this severe drought, Governor Jerry Brown officially declared a statewide drought emergency, and created mandatory reductions of urban water use by 25 percent. The Metropolitan Transportation Commission (MTC) recently announced that Bay Area Bike Share, the regional bike share system, will be expanded into Berkeley, Oakland and Emeryville over the next two years, with a target of adding 400 bicycles in Berkeley, 850 bicycles in Oakland and 100 bicycles in Emeryville. The expansion will coincide with expansions in San Francisco and San Jose, where the existing bike share system is already in place. UC Berkeley's Crowdfunding platform: where students, faculty, staff members, and researchers can raise money to turn their great ideas into reality. The website currently includes five projects focusing on topics ranging from health and sanitation to “the science of a meaningful life,” and will be online from April 6 to May 6 for a 30-day trial period. The Landscape Architecture and Environmental Planning Department at UC Berkeley partnered with the San Lorenzo Village Home Association and StopWaste to compile a booklet containing color photographs, watercolor paintings, illustrations and drought tolerant plant identifications. There are also recommendations for four drought tolerant garden designs. Learn More. For the past ten years, Peidong Yang has been trying to make like a tree. Yang, a professor in UC Berkeley’s Department of Chemistry, researches artificial photosynthesis, a process that mimics a leaf’s ability to convert sun, water, and carbon dioxide into fuel. But in his case, the fuel isn’t glucose—it’s gasoline. Learn more. In my 20+ years at Berkeley, this was one of the best initiatives I have ever seen. I was extremely pleased with what I and my team were able to accomplish." This was one of the many comments received by Space and Capital Resources during the recent Law School Complex clean up. Sustainability is all around us- it can be a hobby, passion, major, career, or any combination. For me, sustainability is something I have the opportunity to explore in the classroom and practice in my community. As the Vice President of Sustainability for the Panhellenic Executive Council, my community happens to be thirteen chapter houses and two associate chapters consisting of over 1500 campus women. I have the unique opportunity to guide the sustainable advancement of these women and their Panhellenic organizations. Let’s Talk Trash: A Slam Dunk for Zero Waste! On Sunday, March 1st, not only did the California Golden Bears Men’s Basketball team challenge Oregon State on the court, winning 73 to 56, but also tried defending their title in the national Recyclemania Game Day Challenge and the new Pac-12 “Road to Zero Waste” competition! UC Berkeley has won in the waste diversion category for the past two years in a row! Apply to the 2015 Cal Energy Corps Summer Internship Program! Following a web conference with the UC Berkeley Office of Sustainability and Energy a year ago, the Alameda County Sustainability team has developed a green and healthy events certification program. This program was inspired by UC Berkeley's own Green Event Certification program. Gracing the College of Engineering this year are new energy-efficient lighting, fans, irrigation systems and solar panels – tangible improvements made possible through the College’s reduced energy consumption. The College received $134,000 in incentive payments in early 2014, and another $125,600 in January 2015, through the Energy Incentive Program, part of the Energy Management Initiative, an Operational Excellence project. The innovative program gives campus departments a financial incentive to save energy. Was this weekend’s rain enough to end the drought? 2014 Sustainability Report released – how is the campus doing? Berkeley recently finalized the latest Sustainability Report, showing our progress towards our goals and becoming a more sustainable campus. The Energy Office has been working diligently with campus departments to reduce energy use through various channels, including the Energy Incentive Program (EIP) and through supporting technical work in building systems, since the establishment of the Energy Management Initiative (EMI). Collectively, their efforts have been remarkable in reducing campus energy use, but none other has been more successful in a short period of time than the holiday curtailment shutdown. The University of California recently created the President’s Carbon Neutrality Student Fellowship/Internship Program to support UC’s goal of achieving carbon neutrality by 2025. Kicking off the spring semester on a green note, the Berkeley Sustainability Community held its first Community of Practice meeting last Friday to discuss and create goals for the upcoming year. Fostered by the Office of Sustainability and Energy, the Community of Practice’s main focus is for “people who share a concern or a passion for something they do [to] learn how to do it better as they interact regularly” (Wenger-Traynor). How Are Energy Incentive Program Payments Being Used? UC Berkeley’s Energy Incentive Program (EIP) is a key part of the Energy Management Initiative. Prior to the EIP, campus Operating Units (OUs) had no direct financial incentive to implement energy-saving measures. The EIP established a baseline for each building based on 2010-2011 electricity use. Units that are below their baseline receive payments, while OUs which exceed their baseline will be asked to pay the difference. Now, thanks to the EIP, campus OUs have a significant incentive to reduce energy use. It has been a busy and exciting fall for myPower at Berkeley. 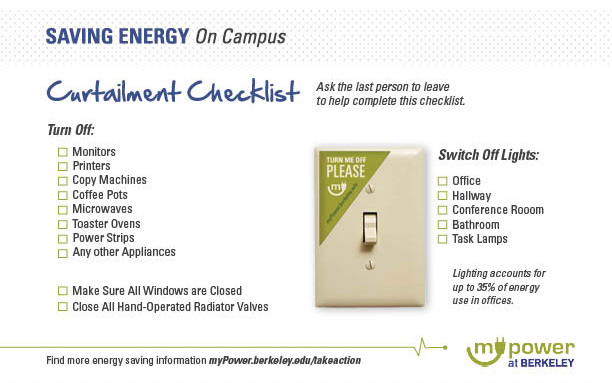 From social media outreach to adding more live Pulse energy dashboards online to spreading turn-off-the-light stickers through campus, myPower has continued to help empower UC Berkeley students, staff and faculty to take action and reduce energy use. The past few months, myPower has completed energy surveys in numerous campus buildings and offices, including the Energy Biosciences Building, the Office of Legal Affairs, and Mulford Hall, and has worked with building occupants to identify new ways to save energy. The Office of Sustainability and Energy (OSE), Residential Sustainability Program (RSP) and PowerSave Green Campus (PGC) invite you to engage in a multimedia presentation on climate change and climate action given by ACE (Alliance for Climate Education). Why Attend? Young people – YOU - have the most to lose when it comes to climate change, and the most to gain by fighting it. ACE (Alliance for Climate Education) helps you take control of your future. Be the change! Berkeley Ranks #1 in Environment/Ecology! UC Berkeley celebrated international Food Day 2014 by going super-local, no mean feat for such a big campus. On Friday night, dinners served in all Cal Dining cafes were made almost entirely from foods grown, produced or milled within 260 miles. You can now view and download the IARU's Green Guide for Universities. A picture is worth a thousand words! During the “Getting Your Bearings” tabling event 2014, we asked students to share with us ways they are living sustainable lives. Aside from striking a pose, students are engaging the campus community in a multimedia dialogue about the importance of leading sustainable lifestyles via our Instagram page! Three student fellowships are now available with the University of California Global Food Initiative. The Office of Sustainability and Energy is excited to announce the latest member of the green department family to recertify their efforts: the University Health Services (UHS) – Tang Center. Originally certified in 2012, the UHS Tang Center has spent the past two years focusing their environmental efforts on waste and energy reduction. Did you know that in the U.S., toilet flushing is the single highest use of water in the average home? While newer, efficient toilets use closer to one and a half gallons of water per flush, older models can use up to seven gallons. Did you know that since February, the campus has reduced water use by ten percent? For an array of useful tips on how to save water on campus and at home and for more information on what UC Berkeley is doing to conserve water, visit the campus drought alert page here. The start of the school year is the perfect time for new and returning students alike to become engaged in campus sustainability. Learn about the different environmental organizations and initiatives at UC Berkeley by attending these upcoming events. Interested in learning more about what is causing California's drought? A four miles high, 2,000 miles long high-pressure ridge is pushing rain north and preventing it from reaching California. No one knows exactly what is causing such an unusual ridge, and this ridge is even worse than the one which contributed to the 1976-1977 drought. UC Berkeley has been awarded the 2014 APPA Effective & Innovative Practices Award for its submission "Providing Financial Incentives to Promote Energy Conservation by Building Occupants". As one of the five schools selected, UC Berkeley received a $4,000 cash award sponsored by Sodexo. Have you noticed brighter, better quality light in buildings throughout campus, or lights that turn on once you enter a room? These are all due to projects undertaken to reduce energy usage on campus as part of the Strategic Energy Plan, which saves the campus millions in energy costs. Credit: Robert Durell. 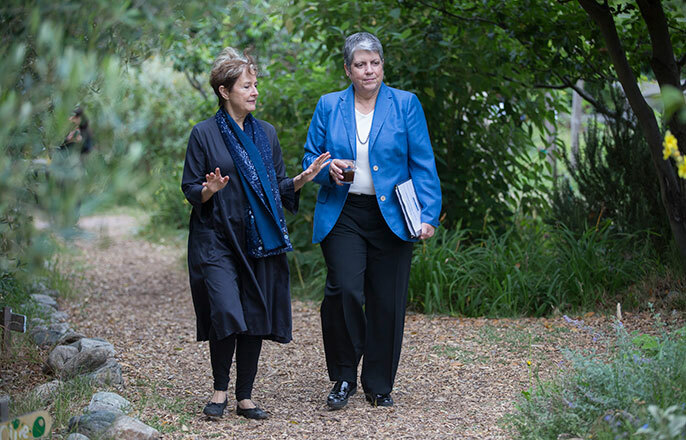 UC President Janet Napolitano (right) tours the Edible Schoolyard at Berkeley's Martin Luther King Jr. Middle School with founder and restaurateur Alice Waters. UC Berkeley was announced Wednesday as the recipient of a $1.5 million grant awarded by the U.S. Environmental Protection Agency to conduct research measuring household combustion created by cooking, heating and lighting. Through the grant, UC Berkeley researchers plan to measure how cooking with stoves contributes to outdoor air pollution and to introduce cleaner alternatives for developing countries suffering from cookstove pollution. Led by campus environmental health sciences professor Kirk Smith, who is serving as the principal investigator on this project, the team of researchers plan to conduct fieldwork in a largely agricultural and rural community south of Delhi, India, to study the impacts of cookstove pollution. UC Berkeley's Cal Climate Action Partnership (CalCAP) has been recognized for its leadership in climate action - for meeting its first greenhouse gas emissions reduction target and for the strategies that brought this success including student and faculty engagement, innovative planning, broad partnerships, financial investment, and the institutionalization of carbon reducing strategies throughout the organization. It’s finally decided: UC Berkeley has successfully defended its title in the national collegiate waste-diversion competition, Recyclemania. The campus received official word this week that, for the second year in a row, the Bears took first place in the national “Game Day” competition, with a waste-diversion rate of 93 percent at its March 8 men’s basketball home game against University of Colorado Boulder (which Cal won 66-65). UC Berkeley’s innovative Building Clean Up Week goes to Kroeber Hall this week. Building Clean Up Week is an innovative program, sponsored by Space & Capital Resources, to help the campus community purge junk in order to create more usable space. How will environmental change affect life? As a boy growing up in Syracuse, NY, Sol Hsiang ran an experiment for a school project testing whether plants grow better sprinkled with water vs orange juice. Today, 20 years later, he applies complex statistical strategies to examine sobering, large–scale versions of the same basic question: How will environmental change affect life? We are pleased to announce two Green Department re-certifications last month – both Capital Projects (down on Uni­versity Avenue) and the UC Police Department submitted and qualified for the highest award bracket (Green). UC Berkeley staff from a variety of departments came together to exchange ideas about sustainability and learn how to incorporate sustainable practices into their offices during the Office of Sustainability’s third annual Staff Sustainability Training. The free WORKbright green event took place on Friday, February 28, from 10 am to 5pm. “What steps are you already taking to save energy?” Rohini Rajgopal, myPower Energy Associate and 3rd year Public Health Major, asks this question during each of the energy surveys she assists in conducting. Continuing and improving on a long tradition of energy curtailment during the winter holiday, the Energy Office is reporting even more savings this past curtailment than the previous year. A total of $113,200 in energy costs were saved throughout the December 2013- January 2014 closure. California’s official drought emergency approached the one month mark and UC Berkeley intensifies its efforts to conserve H20. At the inaugural meeting of the Berkeley Sustainability Community, a new forum for environmentally minded students, staff and faculty to meet together and share ideas about how to conserve. Funded my the National Science Foundation, UC Berkeley scientists will receive $4,900,000 over the next five years to study the nearly 10,000 square kilometer Eel River watershed in Northern California and how its vegetation, geology and topography affect water flow all the way to the Pacific Ocean. A new development by researchers at the University of California, Berkeley, could lead to curtains and other materials that move in response to light, thus eliminating the need for batteries. On Jan. 1, UC Berkeley will take on a new year’s resolution of sorts as the campus implements a new energy use policy aimed at saving energy and reducing costs for the years to come.